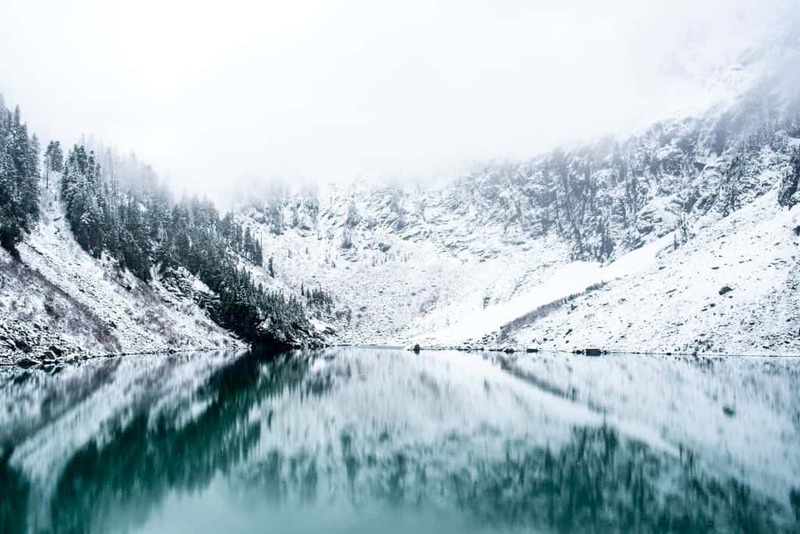 Although winter in Washington is known for being a tad gloomy and rainy, there are some serious perks to braving the cold and wet for an adventure! The summer crowds have died down, the mountains have snow, and you can go on a sunset adventure and still make it home in time for dinner. 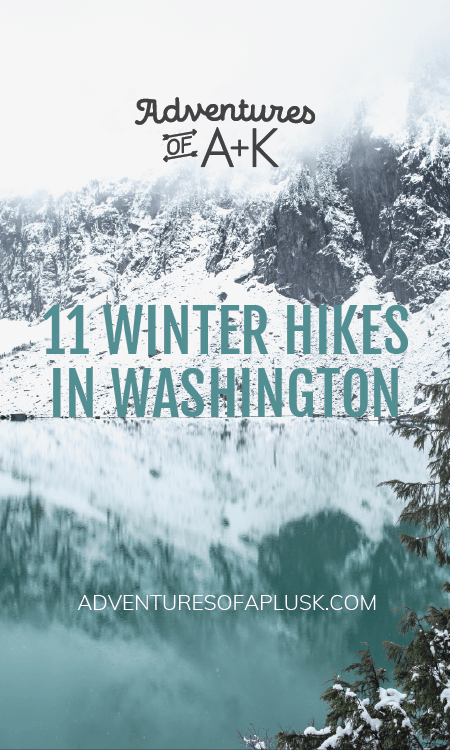 Since moving to Washington we made a promise that we would never let weather stop us from exploring and we have discovered quite a few incredible hikes that are still a blast in the snow and rain. Here’s a list of our 11 favorites below, including mileage, elevation gain, and any tips we have. Note: Avalanches are a dangerous threat in the winter, so please make sure that any trail you explore is safe. We tried to only include safer trails on this list, but recommend that you always do research in advance to see conditions. 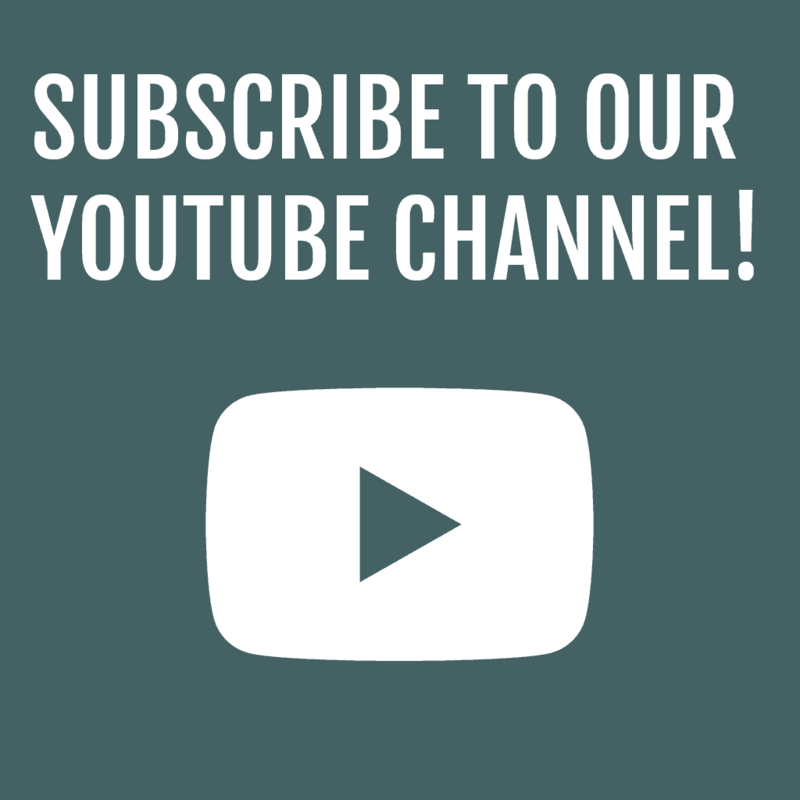 Northwest Avalanche Center is a great resource! 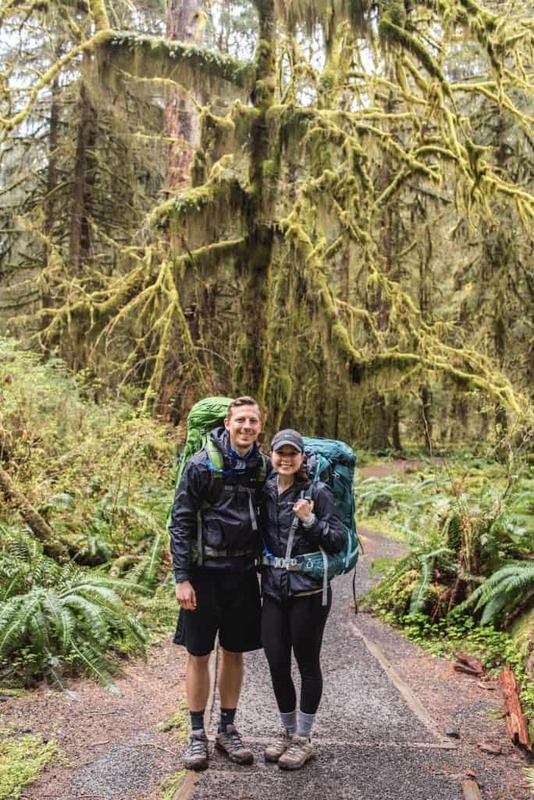 PS: If you’re looking for some non-hiking rainy and snowy day activities, make sure check out our How to Survive Washington’s Rainy Season blog! And if it’s not winter and you’re looking for a good warmer weather hike, read about our 25 favorite hikes. 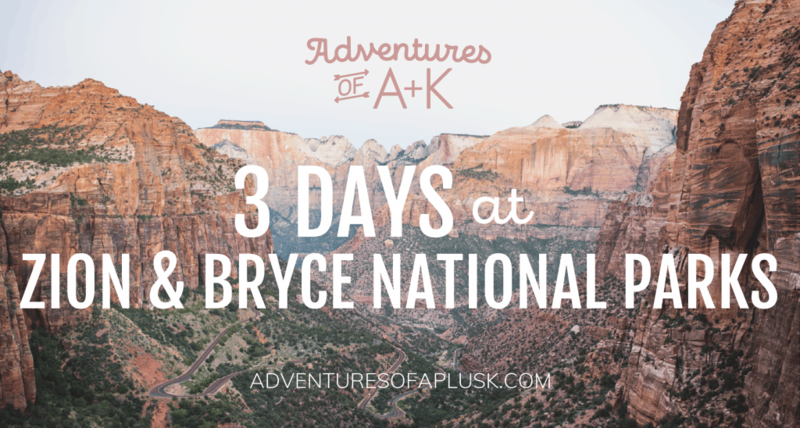 The blog is about a year old and we have quite a few new favorites we would love to add, but all of these hikes are still incredible! 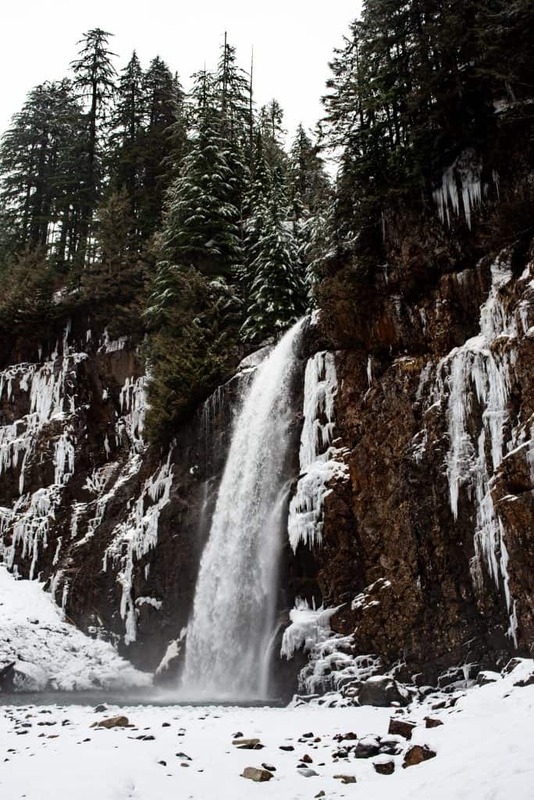 Franklin Falls is a classic, quick hike only an hour from downtown Seattle. 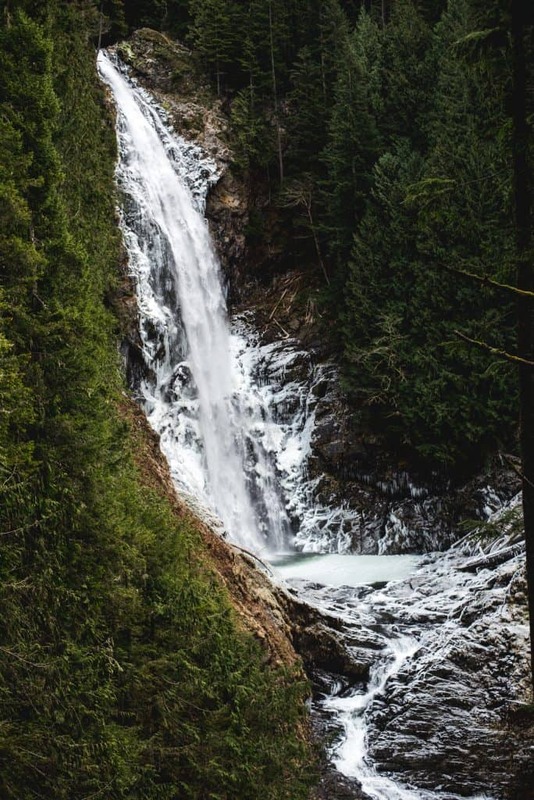 Its accessibility makes it a popular hike year round and it has become one of our favorites for a rainy day. But this winter we finally made it out to the falls to see them in a more frozen state and it was MAGICAL. Although they weren’t as frozen as they can be when we went, they were still gorgeous! One important thing to know is that they close the road to the trailhead in the winter, so you have to hike about 2.5 miles each way on the road to the trailhead, making the hike quite a bit longer, but still an easy and relatively flat journey. Make sure you bring spikes for this hike! Similar to Franklin Falls, Gold Creek Pond is a super easy “hike” (more like a walk) that is perfect in the winter. It’s a popular snowshoeing area and has a few good spots to enjoy a nice picnic lunch (we took Wild Zora soups with us there to make and it was awesome to have a hot snack!). There are also beautiful mountain views if you go on a clear day! 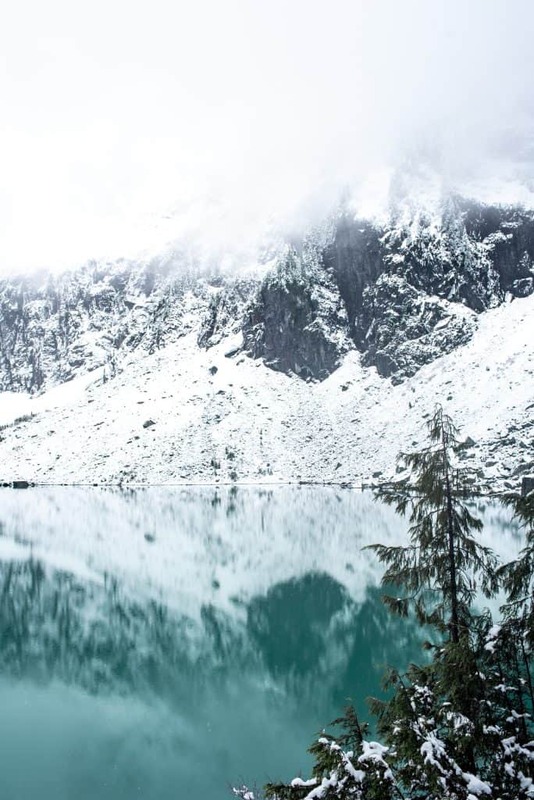 Lake Serene in the winter is breathtaking! The trail has so much to offer–views, a gorgeous waterfall, and an impressive lake surrounded by some awesome peaks. The super clear blue water against the white snow is one of the most beautiful things we have ever seen. Make sure you bring some spikes for this hike! We have recently fallen in love with snowshoeing. We aren’t very talented skiers, but still love getting out in the mountains when there is a ton of snow, so snowshoeing is perfect for us! 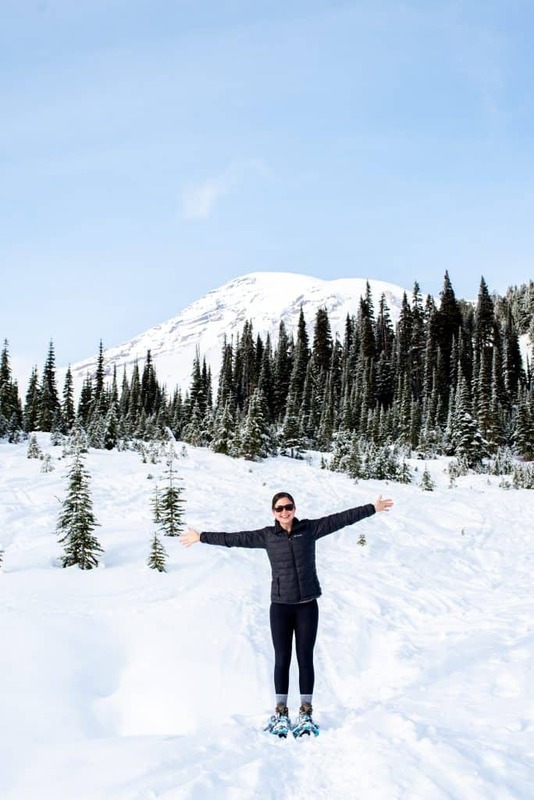 We went snowshoeing at Mount Rainier late this fall and had the best time wandering around and seeing Mount Rainier up close (still one of our favorite things about Washington!). Panorama Point is a popular route, but you don’t even have to do the entire thing (we didn’t) and still benefit from the amazing scenery. One thing to keep in mind is that they usually open the gate to access the Paradise Visitor Center at 9 AM everyday, but it can vary, so make sure to check their Twitter for updates.You’re also required to carry chains (even 4×4 and AWD) to drive up to Paradise, so come prepared! 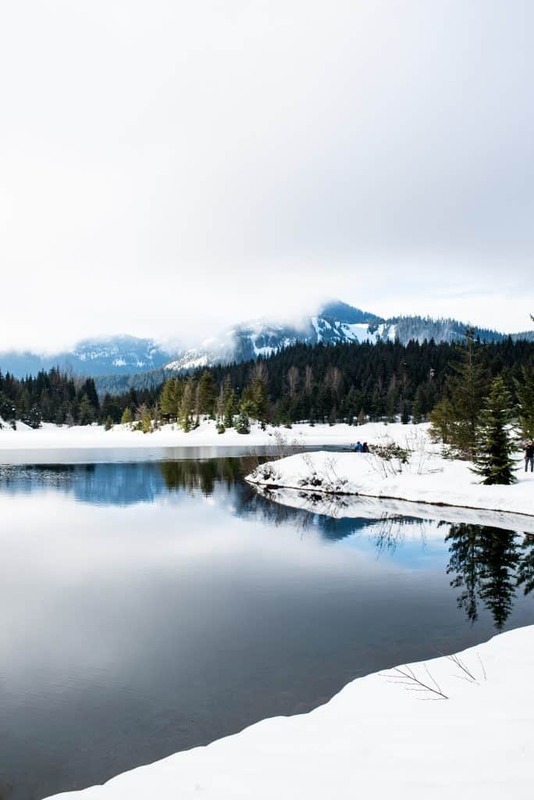 If you are looking for another good snowshoeing route, we hear Skyline Lake is awesome! 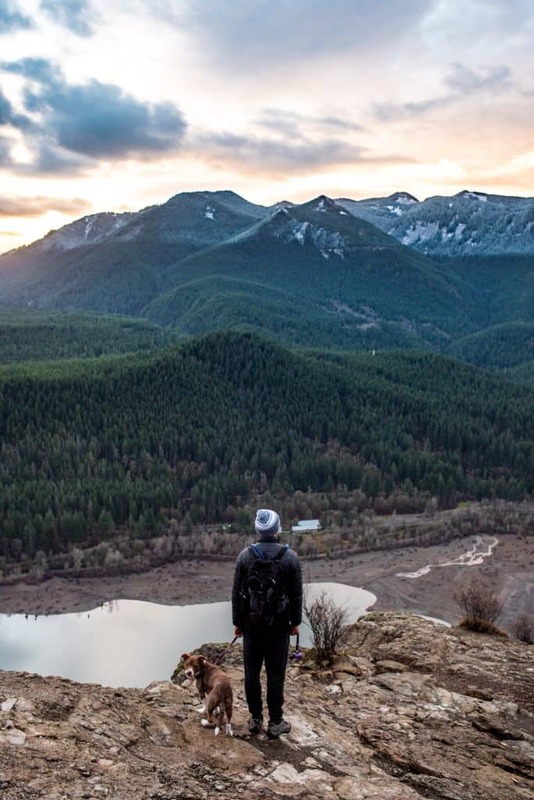 Rattlesnake Ledge is most likely the most popular hike close to Seattle. And for good reason! It’s accessible year round (usually no snow), low mileage, and has awesome views! While this hike usually stays snow and ice free, make sure to check trip reports on WTA beforehand, because you’ll definitely want some spikes if it’s at all icy! We suggest going for sunrise to have less crowds and to enjoy a colorful sky. Murhut Falls became one of our favorite waterfalls in WA this past fall. 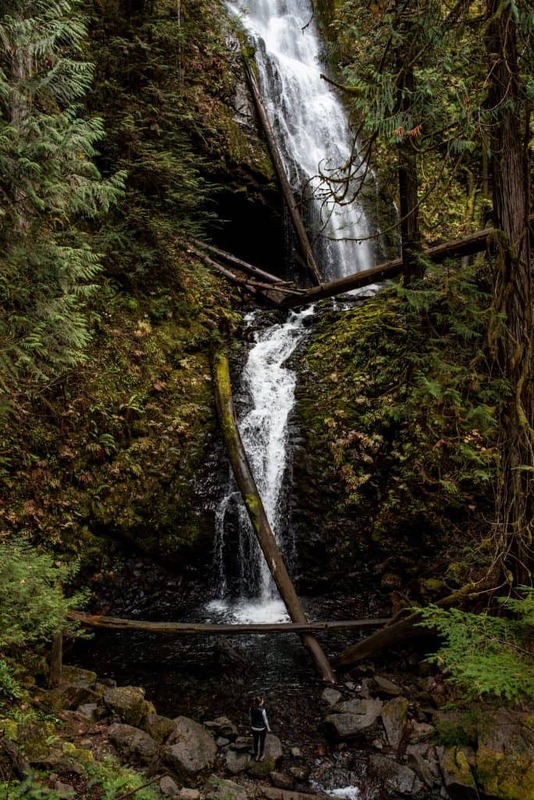 It’s a tiered waterfall on the Olympic Peninsula that only requires a short hike to get to. But one of the best things about this waterfall is that you can get really close to it (a huge bonus!). 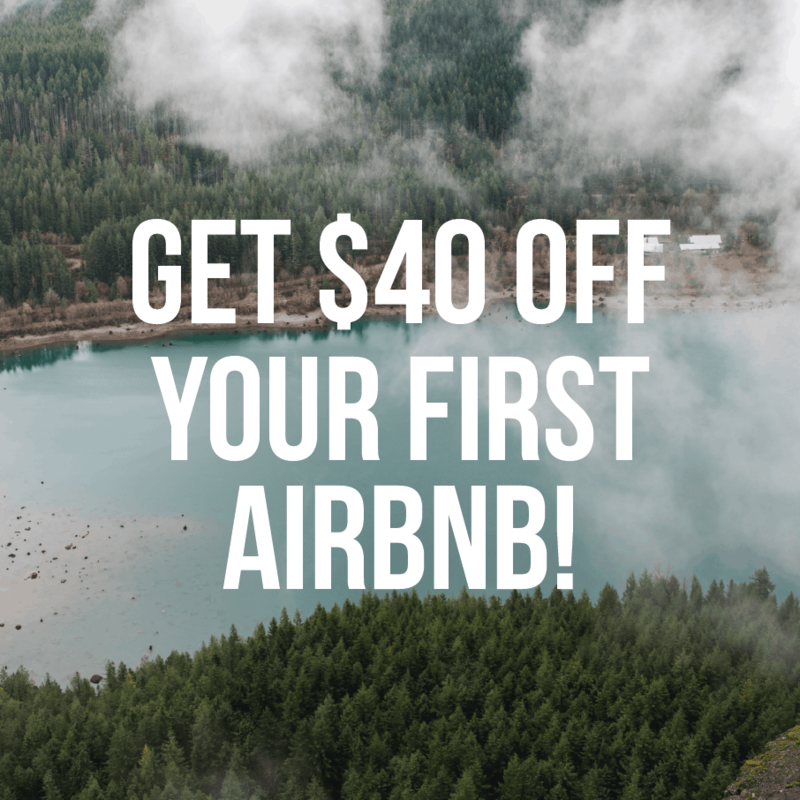 It also makes for a great stop on an Olympic Peninsula road trip! The Hoh Rainforest is the first place we ever backpacked and it’s such a Washington gem! While you may encounter a lot of rain here, it’s a safe and fun place to explore in all seasons. The mossy green trees are endless and so much fun to walk through. We recommend making it to Five Mile Island, but if you are short on time, doing just a small portion of the trail will still give you a great rainforest experience. Also, the majority of the Olympic Peninsula is super accessible and fun no matter the season. 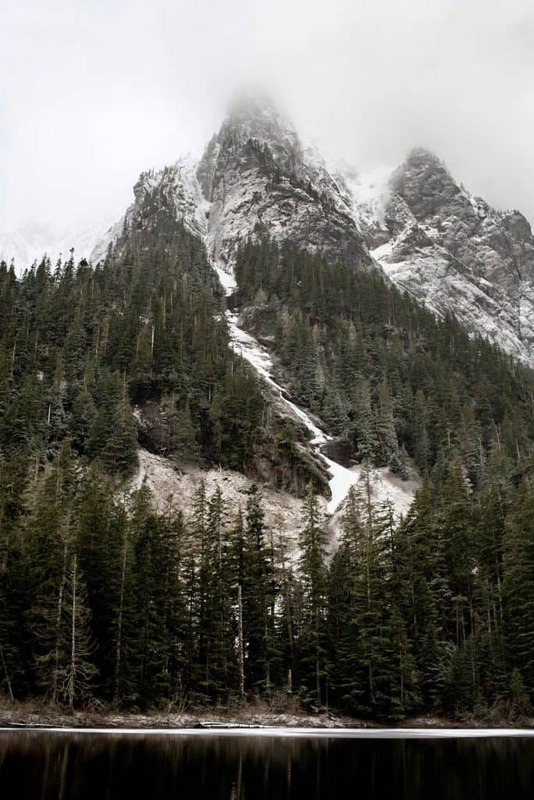 Get more Olympic Peninsula adventure ideas in our Weekend on the Olympic Peninsula guide. Poo Poo Point is one of the closest hikes to Seattle and a very unique one! 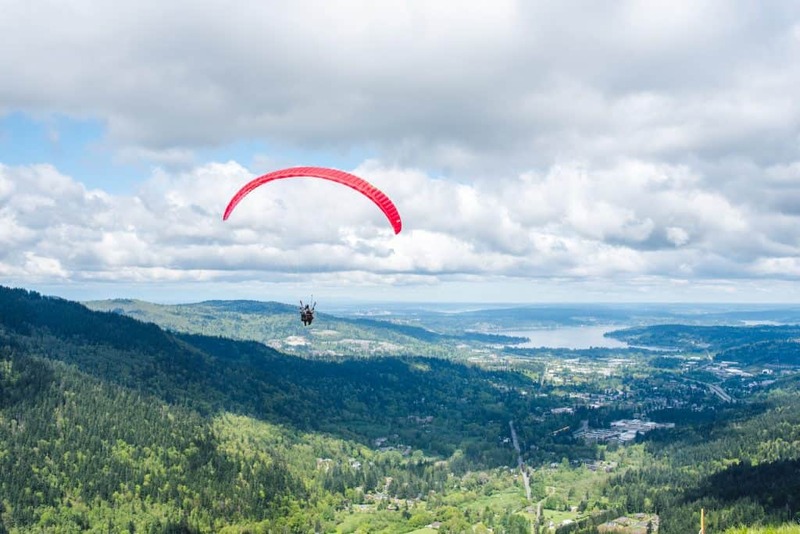 At the top, you can watch paragliders take off, which is one of the coolest things to see! There’s also a great view of Mount Rainier if you go on a clear day. While this hike can get snow (we hiked it for the first time in the snow), it tends to be snow-free most of the year. However, if there is snow, definitely bring spikes! We hiked this without spikes and it was insanely slippery and a challenge. Barclay Lake is a great quick and low elevation gain hike with a big payoff at the end. Follow the wooded trail for 2.2 miles until you reach the lake, where you’ll have a crazy view of Mount Baring! You can also camp here, making it a great winter backpacking spot without crazy amounts of snow. We’re throwing in a lot of waterfalls on this list because 1. Waterfalls are awesome! And 2. They are the perfect hike for non sunny days! We have hiked to Wallace Falls 3 or 4 times, with the first time being in the winter. We got to see the waterfall partially frozen, our first time ever seeing one like that, and it was stunning! Make sure to visit all 3 viewpoints to see the waterfall from different heights and angles. Photo by our friend Allie at Adventures After Coffee! 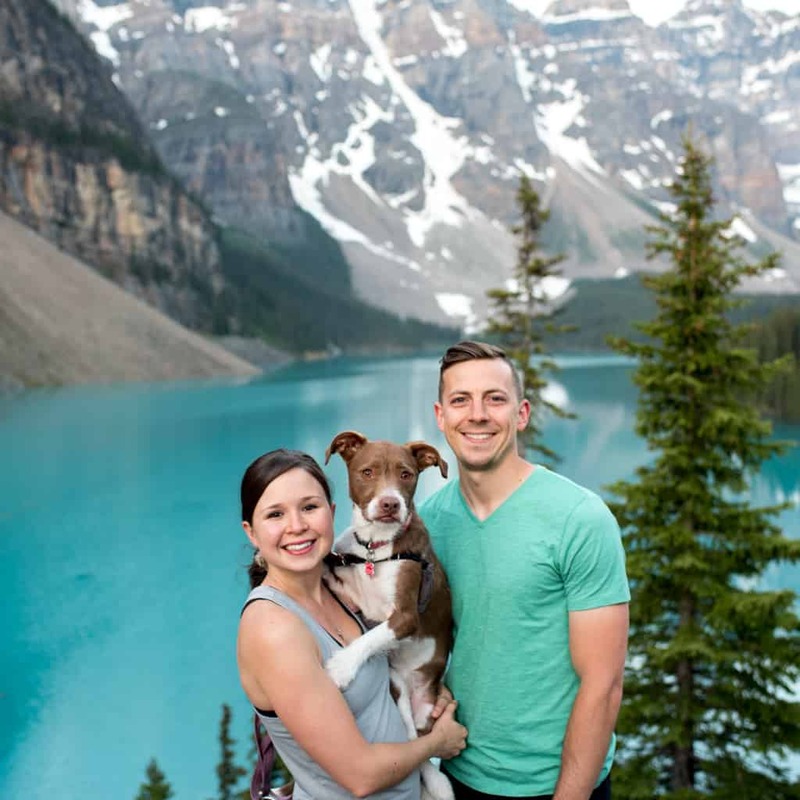 Check out her blog for tips on group traveling, what to do in different US cities, and how to travel while working full time! Okay, so we are cheating a bit here. 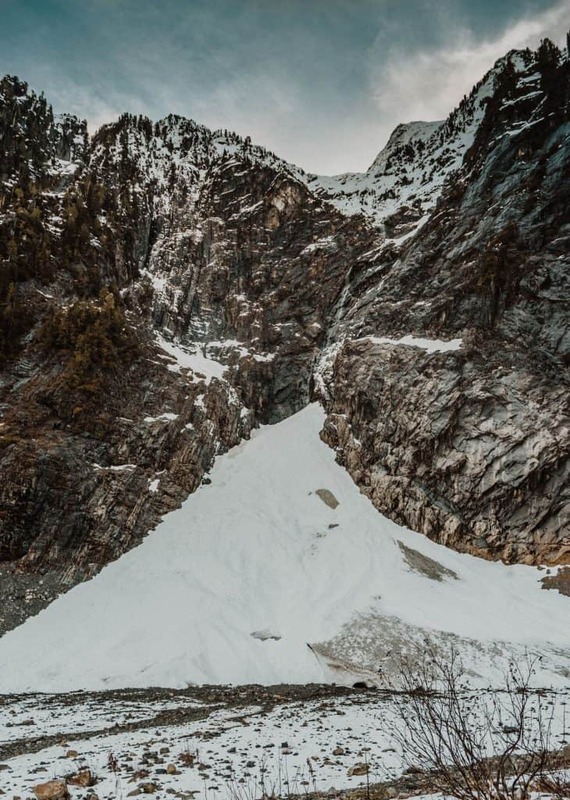 We never actually got the chance to do the Big Four Ice Caves (which is why we are using our very talented friend Adventures After Coffee‘s photo). 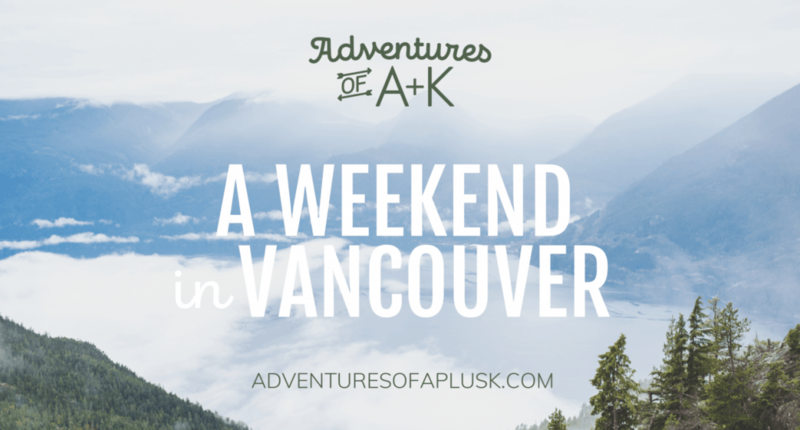 We were planning to this hike this past weekend, but Seattle had a snowpocalypse and we stayed inside all weekend. However, we have heard so many good things about it and will be making out there as soon as we can! A few things to know: the road is sometimes closed getting to the trailhead in the winter, so similar to Franklin Falls, you’ll have to walk along the road. Also never ever go inside the caves or climb on them. Many people have died doing this. It’s not worth it! Ready for a winter adventure? 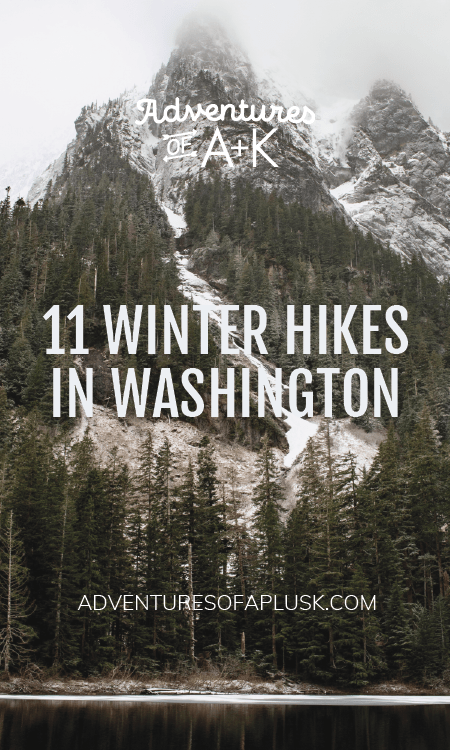 Pin this blog to help plan your next Washington winter hike! We’d totally just live in the van here 24/7 if there weren’t so many other spots we wanted to explore! It’s going to be VERY hard to leave!